PGE Proud Media Sponsorof the RI Community Food Bank Summer Food Drive. Helping to put food on the table for struggling families all summer long. 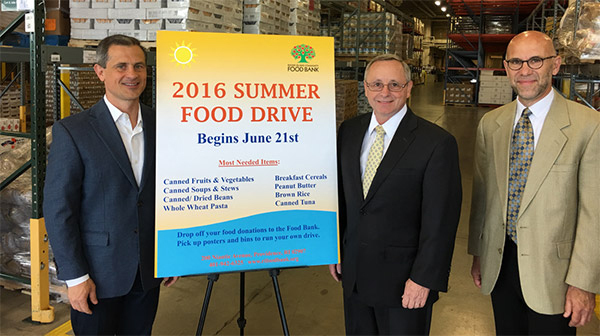 On June 21, 2016 PGE President & CEO Ken Poyton attended the RI Community Food Bank Summer Food Drive Kick Off Breakfast. PGE is once again the proud media sponsor of the Summer Food Drive. Pictured from left to right: Andy Moffit RI First Gentleman, Ken Poyton, and Andrew Schiff Chief Executive Officer, RI Community Food Bank. All across our great state, Rhode Islanders are doing their best to take care of their families. However, did you know 1 in 7 households in Rhode Island have food insecurity? Wondering when or where their next meal will come. For those who are struggling, summer can be an especially hard time. Since 1927, PGE has been caring about the families we serve and doing our best to support all the people of Rhode Island. I am proud to announce PGE is once again the media sponsor of the Rhode Island Community Food Bank’s Summer Food Drive. The RI Community Food Bank has an aggressive goal, trying to raise 150,000 pounds of food, which will barely meet the needs of the 50,000 children per day who receive free or reduced lunches throughout the school year. We encourage you to get involved and make a difference by running a food drive or fundraiser. Every dollar you give provides three pounds of healthy food for a family in need. To make a donation go to RIFOODBANK.org. Please help us build a stronger community by making sure no Rhode Islander goes hungry this summer. Thank you in advance for your support! All across the great state, Rhode Islanders are doing their best to take care of their families. However, for those who are struggling to feed their families, summer can be an especially hard time! Since 1927, PGE Federal Credit Union has been caring about the families we serve and doing our best to support all the people of Rhode Island, and so we'd like to remind you to get involved with the Rhode Island Community Food Bank's summer food drive. You can make a difference by running a food drive or fundraiser in your own community. Find out more or donate online at RIFOODBANK.ORG. Remember, every dollar you give provides three pounds of healthy food for a family in need. Please help all of us at the PGE Federal Credit Union Build a stronger community. Thank you for your support!